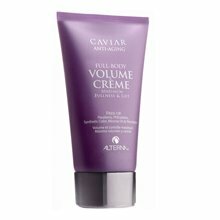 Alterna Caviar Volume Anti Aging Full Body Volume Creme was formally packaged as Alterna Caviar Volume Molding Creme and is perfect for any hair type. It is a styling creme that will not leave your hair feeling stiff or sticky, and provides a long lasting, medium to firm pliable hold while adding great texture and volume. It provides protection from hot tools, and chemical and environmental damage while lifting your hair at the roots, shaping, molding, and sculpting it for a thicker, fuller, and a natural look and finish.